Golberg Restoration Co. - Cleaning of Gold Plating. Cleaning and repair of silver, gold plated, and silver plated objects. Our proprietary technology allows us to safely clean silver and plated objects. We also remove scratches, correcting dents, and re-planish the form. 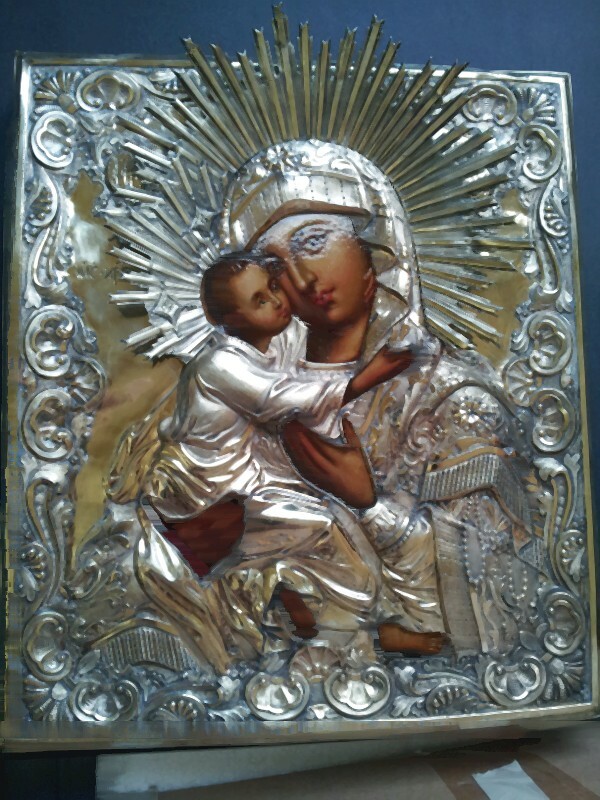 Below is an example of proper and safe cleaning of gilded icon frame. The picture on the left shows how dirty and dull the object has become. In the middle, we had partially cleaned the frame as an illustration of the proper cleaning technique. 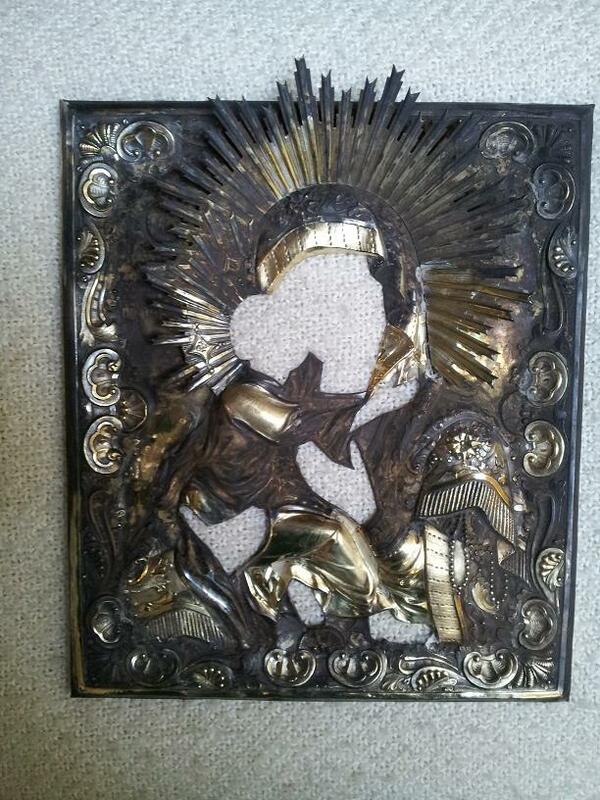 The picture on the right shows the whole frame cleaned, polished, and brought back to its original luster. Note, this is proper cleaning which does not remove any of the gilding. Gilded objects gets dull with time as dirt accumulates on the surface. Silver gilt (vermeil) objects. Silver base with applied layer of gold. Gilt bronze (ormolu). Bronze has been coated with a layer of gold. Silver plate. Base metal with applied layer of silver. Mercury gilding. Amalgam of mercury and gold, mercury is driven out by heat resulting with gold bonding to silver base. Due to toxicity of mercury, this technique is not common at present day. Sheffield plate - Copper objects are coated with silver by fusion. Electroplating. 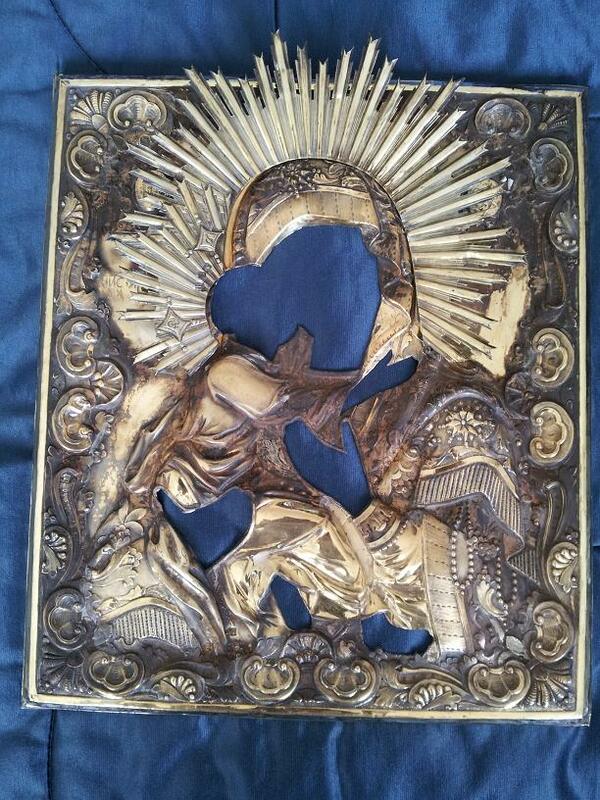 This process of coating base metal with a layer of either gold or silver is achieved by placing the object in a bath of gold or silver solution, utilizing electricity to bond the plating layer to the base. Due to thin depth of the plated layer, plated objects need to be treated with care, as not to disrupt the plated metal. Our methodology emphasizes preservation of original artwork without doing any harm to the original object. We had created a better method to bring back dirty and dull gilded objects back to their original luster, while preserving the object. We have developed technique to safely clean and polish gilded artifacts. Our methodology safely restores dirty objects to their original condition. In addition to cleaning, we offer bonding together broken objects, as well as recreation of missing elements. Please call, e-mail,or write our office, or follow this link for additional information to place an order.